JEE Advanced 2018 Anwer keys, Question Papers 1, 2 at jeeadv.ac.in: To improve the gender balance in the undergraduate programs at the IITs, a decision has been taken at the level of the IIT Council to increase supernumerary seats from the current (approximately) 8 per cent to 14 per cent in 2018-19. JEE Advanced 2018: IIT Kanpur has released the questions papers 1 and 2 (both English and Hindi) of the Joint Entrance Examination (Advanced) 2018 on the official website – jeeadv.ac.in. The exam was held on May 20 and the answer keys will be uploaded by the end of this month. Nearly 2.2 lakh students appeared for the JEE Advanced examination this year. JEE Advanced 2018 was held in its first ever Computer Based Mode (CBM) on May 20 at various test centres across the nation. As per the schedule released by the Indian Institute of Technology (IIT) Kanpur, the JEE Advanced 2018 answer keys will be released on May 29.Further, the copy of candidate responses will be sent to the candidates by May 25 at 10 am. This year, top 2, 24,000 candidates qualified to appear for JEE Advanced 2018. Total number of students who appeared for JEE Advanced 2018: In JEE Advanced 2018, as many as 1,57,496 appeared for the first paper and 1, 55,091 made it to the second paper. According to reports, more than 17,000 candidates did not appear for the JEE (Advanced) examination held in two shifts at 573 centers across the nation. Further, the organising chairman of JEE (Advanced), professor Shalabh said 7,326 candidates skipped the first paper and 9,731 did not take up second paper. All the candidates can raise objections against the JEE Advanced 2018 answer keys from May 29 to May 30. More details on the answer keys will be notified soon. Receiving feedback from candidates and answer keys through candidate portal: From May 29, 10 am to May 30 till 5 pm. Students appeared for the exam found the overall level of paper moderate, though not easy. Some students have rated Maths as easy but Physics relatively difficult. Chemistry was reported to be of moderate level. The total no. of questions (54 questions) remains same as last year. However, total marks of Paper-1 has changed from 183 to 180 marks this year. To improve the gender balance in the undergraduate programs at the IITs, a decision has been taken at the level of the IIT Council to increase supernumerary seats from the current (approximately) 8 per cent to 14 per cent in 2018-19. The performance of a candidate in JEE Advanced will form the basis for admission to the Bachelor’s, Integrated Master’s and Dual Degree programs (entry at the 10+2 level) in all the IITs. 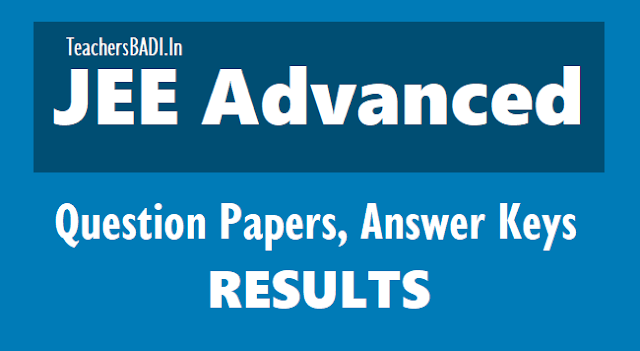 JEE (Advanced) 2018 Question Papers 1 and 2 in English and Hindi uploaded.